Here is our sample Java program to calculate large factorials. You will use BigInteger class to hold the result of calculation. Remember this class is not inside java.lang package, hence you need to explicitly import it, as we have done in this example. Another thing to keep in mind is that, this class is Immutable and any change on BigInteger object will result in another object. So, if you forget to store the result back, you will lose it. Original object will always remain in same state even after addition, subtraction or multiplication. * Java Program to calculate factorial of large numbers using BigInteger class. * Java method to calculate factorial of large number. There is no maximum and minimum limit of BigInteger class, in theory there is no limit for BigInteger. You should use BigInteger whenever you need to represent a big integer number, i.e. something which is not floating point but cannot be represented using long data type. 1. 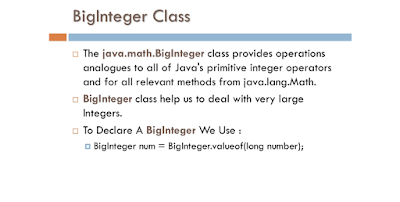 BigInteger class is in java.math package, so you need to specifically import it, it will not be imported automatically like java.lang package. 2. Similar to String, BigInteger class is also immutable, so any modification e.g. addition, multiplication will produce a new instance of BigInteger, leaving original object intact. 3. Theoretically BigInteger has no limit of numbers. 4. 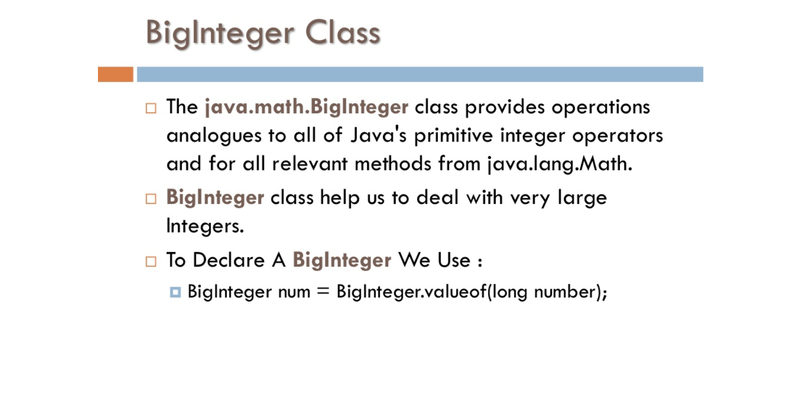 BigInteger class helps to deal with very large numbers in Java.